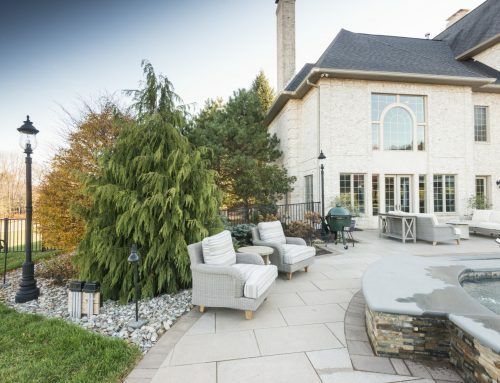 Maybe you put your patio in several years ago without much thought for how your outdoor living needs would change, perhaps you recently moved into a new house and inherited a patio that you’re not completely in love with, or it may be the case that you have the perfect patio and you’re just looking to maximize its value. The good news is that you don’t have to rip up your patio and start from scratch to make it the best it can be. Instead, you can just expand on the foundation that you already have. Your house is your haven away from the hustle and bustle of the real world, and nothing says sanctuary like incorporating the soothing natural elements of a water feature. Many people retreat to their patios during breezy summer days and evenings to unwind with a book or a glass of wine. Not only is water a tranquilizing and mesmerizing aesthetic addition, but a waterfall or fountain will block out neighborhood sounds with calming white noise, enhancing the paradise you’ve built for yourself. We all know that trying to cook indoors during the summer is like living in a sauna, and it also raises the temperature of your home, which kicks your air conditioning into overdrive to compensate. 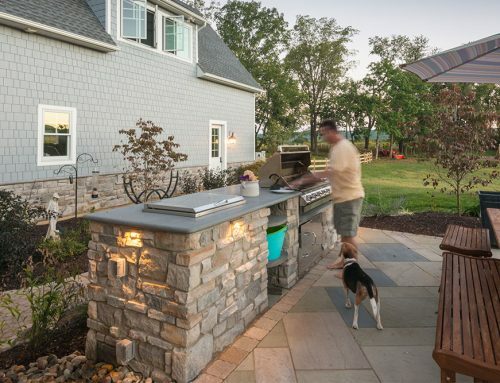 Keep your house a cool refuge by installing an outdoor kitchen. 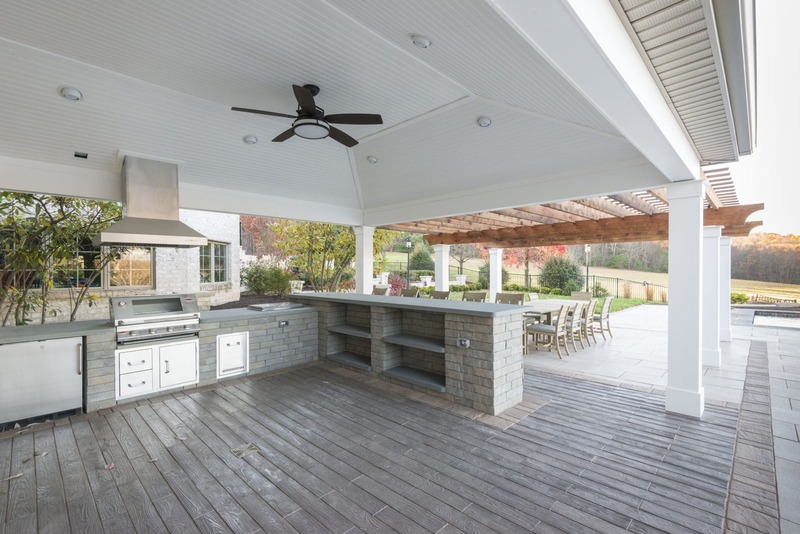 Not only will you appreciate the scenery while you prepare your next meal, but you’ll make your patio a fully functional unit for entertaining. A seat wall visually helps to break up your landscape, and it will also give you the opportunity to accommodate larger parties for outdoor entertaining as well as offer a secondary social hub for those who aren’t seated at the main table. Rather than having to store and squish together more chairs, this beautiful seating tool blends seamlessly into the environment. Lights affect both the usability and mood of your space. A patio without proper lighting can become a black hole of lost living space after dark where you’re bound to stumble down stairs and into furniture. A well-lit patio is not only safe, but serves as a charming backdrop for late night entertainment. Dynamic lighting elements, such as zoning, dimming, and LED color technology, allow for your lights to suit your needs—soft and subdued for a romantic dinner, or bright for cooking, drink mixing, and afterparty cleanup. Add an edge or border to your patio with a complementary material such as brick or cobblestone. This simple addition will not only give your backyard space a polished look, but it also gives and your guests more breathing room. 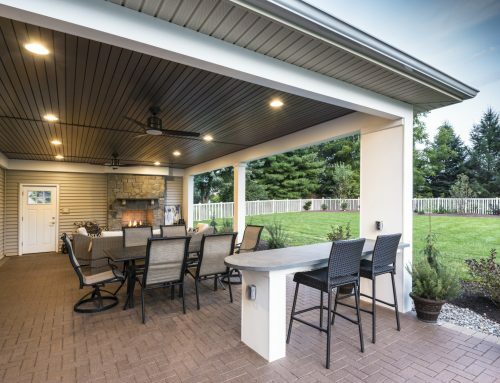 Even a few extra feet of space to stretch out can make your patio feel worlds more comfortable. 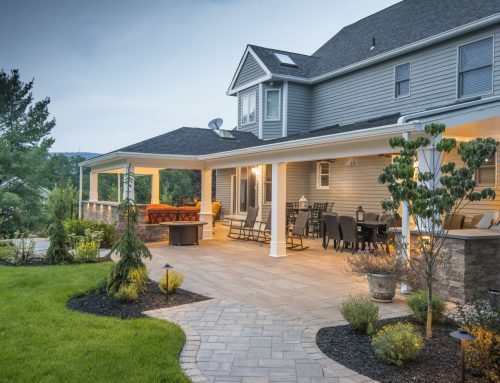 Fully integrate your patio into your outdoor living space by adding a walkway. 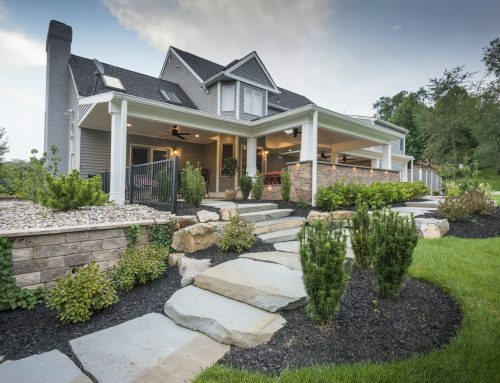 A walkway that links your patio to your driveway provides a fluid path to and from all of the major points of your yard and creates a feeling of gestalt rather than just a collection of amenities. When you’re entertaining outside, your guests can enter the party right from their cars without trudging through the lawn or living room. Best of all, a path through your garden is like directing a guided tour through all of your beautiful landscaping work. Ready to get started or have any questions? Please give us a call at 610.841.9165 or send us an email at info@chestnuthilllandscape.com.